A good choice for bird-lovers, this is an important riparian plant. Not a tree for the small yard, it is important along streams and in wetlands. If you have a spot for it, you can expect to enjoy the wildlife attracted to it: birds use alders for cover and nesting, eating the seeds, buds, and the insects they find there. Our alders are frequented by chickadees, kinglets, siskins, warblers, bushtits, and small finches. Orioles and robins nest there. This fast growing native is common to the mountains and streams of Oregon. Very tolerant of wind and heat, it is a pioneer tree, one of the first plants to come into a disturbed area. Spreading branches are often pendulous at tips. Leaves are dark green above, paler beneath. Attractive bark, catkins, cones. 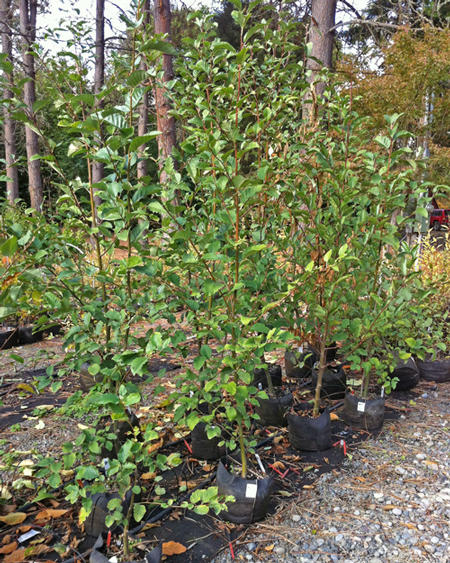 Categories: All Plants, Deciduous, Native Plants, Restoration Stock, More..